Enhanced Omega-3 and all-in-one vitamin & mineral supplement for horses in all life stages. 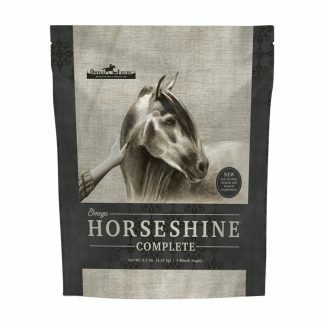 Honoring your First Promise to your horse, we have created in all-in-one supplement featuring Omega-3-6-9, antioxidants, Diamond V® yeast, essential vitamins and minerals that may support healthy, shiny coat; strong, solid hooves; strong immune system; and digestive stability for total health –for horses in all life stages. This enhanced Omega-3 supplement contains the best ratios of the full spectrum of natural EFAs- higher in Omega-3 and 9, lower in Omega-6 – along with synergistic plant and vitamin-based antioxidants from flaxseed. 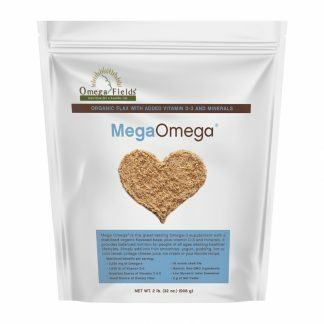 All flaxseed used in Omega Fields’ products is milled to Global Food Safety Initiative standards for human consumption, employing a third party-validated, 5-log Kill Step and PureGlean stabilization processes for long shelf life. The flaxseed is certified to SQF 2000 standards, guaranteed pathogen-free with very low total microbrial values, and guaranteed shelf stable for a MINIMUM of one year under ambient storage conditions – no refrigeration or special packaging required! We have fortified our new Omega Horseshine Complete with a significantly higher amount of Biotin (15mg/day vs 5mg/day in original Grande formula). Some of our customers have asked about any potential problems feeding this increased amount. Biotin is not known to be toxic and has been recommended to be fed to horses in amounts of 20 mg/day in research trials. By comparison, human trials have demonstrated that toxicity was not achieved even at levels of 200 mg/day, which would be the equivalent to 1500 mg/day for an average sized horse. 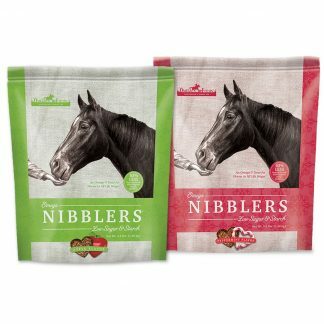 We feel that there is no danger in feeding the amount of 10-20/mg/day to any of the horses that you feed. 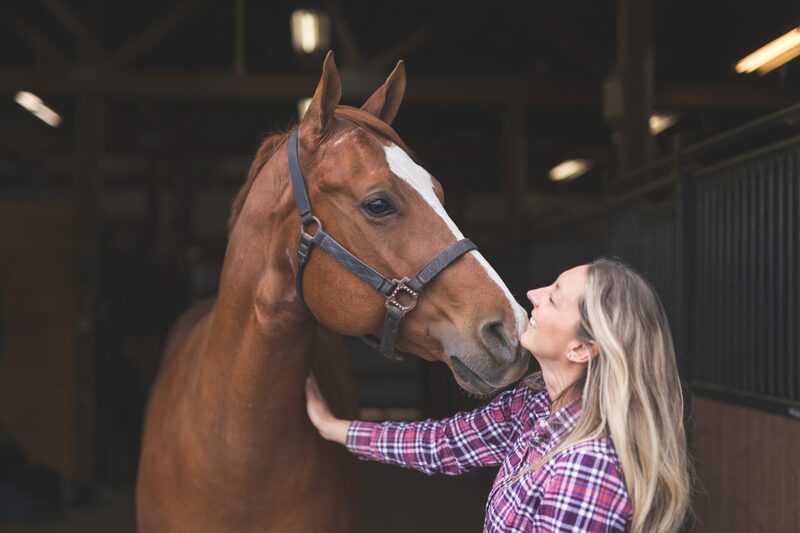 You can have confidence in the Premium, Human-Grade, Non-GMO, 99.9% Pure, Stabilized, Ground, Fortified Flax we use in our Omega Horseshine COMPLETE formula. PureGlean stabilization technology provides a stable, ground, fortified flaxseed composition as a rich source of Omega-3 in the diet. Vitamin A, 33,500 IU/lb. Min. Vitamin E, 1,500 IU/lb. Min. Vitamin D, 4,600 IU/lb. Min. Omega-3 Fatty Acids, 14.9% Min. Omega-6 Fatty Acids, 3.3% Min. Omega-9 Fatty Acids, 3.3% Min. Total Non-structural carbohydrates (NSC) = 5.0% Max. Scoop enclosed (2 scoops equals one serving). 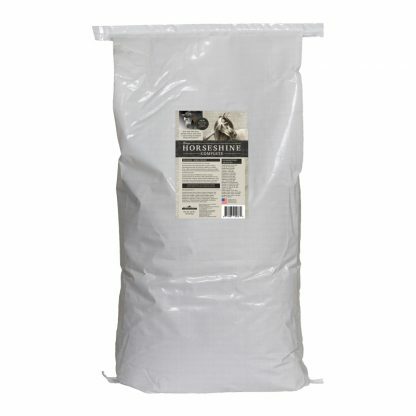 Recommended to feed approximately 5 ounces (142 g), top dressed over feed, or as fed, for 1,000 lb. to 1,200 lb. horse. 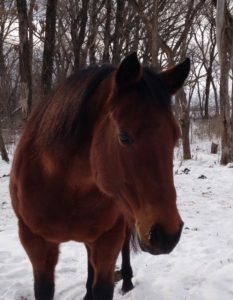 Adjust amount proportionally up or down per weight of the horse. Do not exceed the recommended feeding rate for each horse per day. 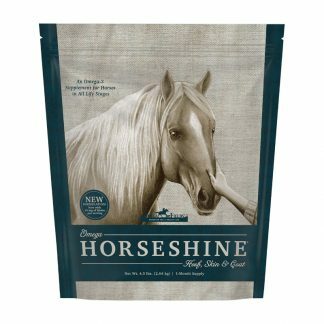 Omega Horseshine® COMPLETE contains complete vitamin/mineral mix for horse’s daily requirements; do not feed with other complete vitamin/mineral supplements. Feed according to the recommended amount shown. Your horse’s total intake of selenium should not exceed 3.0 mg per day. 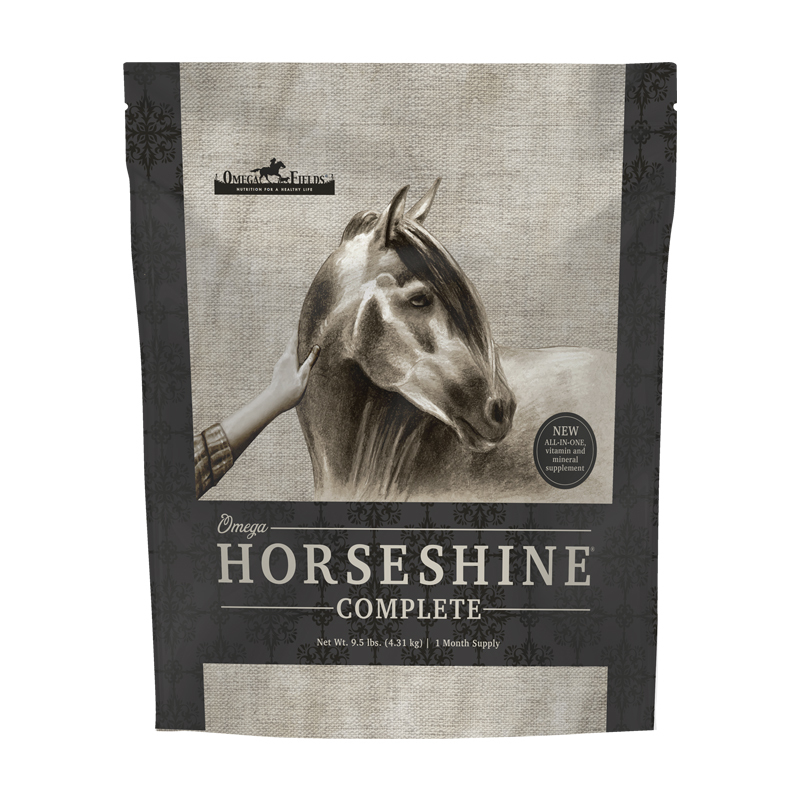 Omega Horseshine® COMPLETE has been precisely formulated to be supplemented “as fed” or “top dressed” over standard / co-op/ mixed feed. Omega Horseshine® COMPLETE is intended to be supplemented to working horses being fed a grass hay. It is NOT a complete feed. 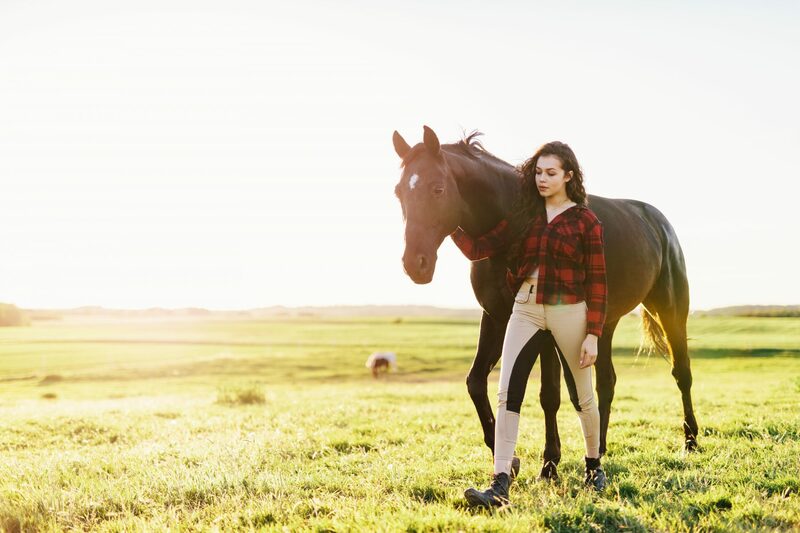 If you are currently feeding a complete feed (per manufacturer’s directions) and wish to top dress with Omega Horseshine® COMPLETE — you will be within safe margins for vitamin/mineral concentration levels. Omega Horseshine® COMPLETE contains complete vitamin/mineral mix for horse’s daily requirements; do not feed with other complete vitamin/mineral supplement. If already supplementing with a complete vitamin/mineral mix, please consider Omega Horseshine® as your Omega-3 supplement. Feed according to the recommended amounts shown. Your horse’s total intake of selenium should not exceed 3.0 mg per day. The stabilized, ground, fortified flax seed used in Omega Horseshine® COMPLETE utilizes PureGlean stabilization technology. The powerful nutrients in Omega GRANDE® are locked in and guaranteed stable for at least 12 months with no signs of rancidity or loss of nutritional value. Best if stored in a cool, dry place. Can you tell me more about the Biotin in Omega Horseshine COMPLETE? What is the Amino Acid Breakdown for Omega Horseshine COMPLETE? How much Iron (Fe) is in a 5 ounce serving (2 scoops)/142 grams of Omega Horseshine COMPLETE? Picky Mare Licked It All Up And Was Looking For More!!! Oh my word – I ordered your Omega Horseshine COMPLETE for the first time. 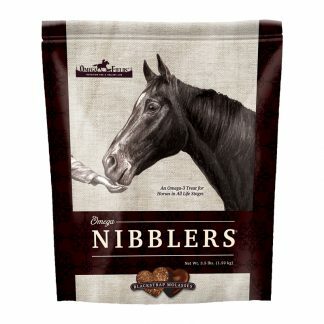 I’ve been looking for a good supplement that my PICKY MARE will eat. I put a scoop in her bowl and she licked it all up and was looking for more!!! Previously, I’ve needed to doctor it up and plead with her to take it, but not this! She loved it even with nothing else in the bowl. Sigh, I’m thrilled!!! THANK YOU for making this!! !